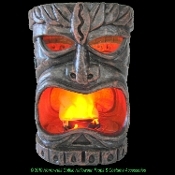 Fake FLAMING TIKI HEAD LAMP Luau Pirate Theme Faux Flame Lantern Party Decoration - Hawaiian Tropical Island Decor. 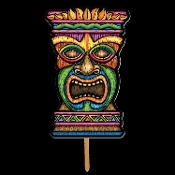 PLASTIC portable dimensional Tiki Totem with stone-look carved features. 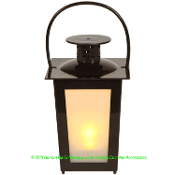 Battery operated fan blows silk-like mouth flames color lights create fire illusion. Get costume party guests all tangled up in our huge Spider Web! Giant white Rope gothic decor SpiderWeb with loops for easy hanging and a durable design. 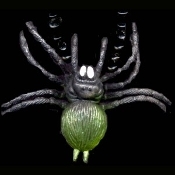 Filled with scary spiders or not, this creepy Halloween decoration sets a spooky mood. Fully extended stretches to 9-feet. 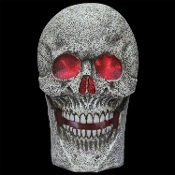 HUGE TWO-FOOT TALL Gothic Multi-color Morphing LIGHT UP SKULL with Classic Moaning SPOOKY SOUNDS Halloween Haunted House Dungeon Cemetery Graveyard Porch Yard Prop. Creepy Grim Reaper Costume Party Decoration. 24-inch Spooky Lighted Pirate Castle Decor. SEE VIDEO! 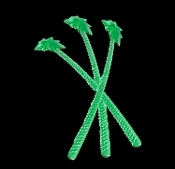 10-piece Set Luau Jungle GREEN PALM TREE COCKTAIL STIRRERS Tiki Bar Pub Swizzle Sticks Pirate Party Safari Theme Decoration Props. New 6-inch long reusable translucent Plastic drink stirs. Bright Transparent Jewel-tone Colorful Island TROPICAL Polynesian Cocktail Accessories. Magic Fun Faces Glitter Tattoos SHARKNADO KILLER SHARK Colorful Stick-on Eye Wear Pretend Play Tattoo Decals. Eye Shadow Face Art Stickers. Fake Temporary Transfers Birthday Party Favors Instant Makeup Effects Cosmetic Accessory. Easy application and removal. Lasts days. 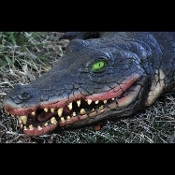 Realistic 4-Ft Long SWAMP ALLIGATOR PROP Vinyl Over Squishy Poly Foam. 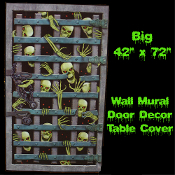 Perfect Luau Decoration, Mardi Gras Pirate themed Birthday party, haunted house Halloween event. FANG-tastically ferocious scary large size lizard Gator Crocodile Jungle wild animal yard garden decor. 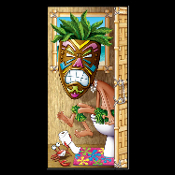 Solar Power Motion Car DASHBOARD HULA GIRL Novelty Toy Luau Beach Party Tiki Bar Dancing Decoration. 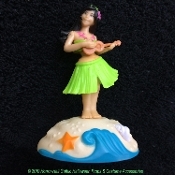 Hawaiian hula girl dancer is solar powered, so she dances in realistic hula motion in bright UV light or sunlight. Features a painted GREEN grass bikini top and hula skirt. Creepy Devil inspired DEMON DISHWASHER DOOR COVER will scare anyone who comes into the kitchen. 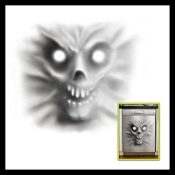 Frighten your guests this Halloween with this cool static cling Spooky Spirit Mural Poster. 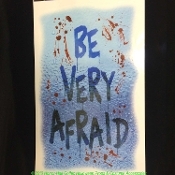 Scary Haunted House horror prop decoration measures approximately Thirty-inches square. GIANT SPIDER TARANTULA PENDANT TALISMAN NECKLACE with Beads - Huge Halloween Gothic Costume Jewelry -GREEN - Choose your bead and cord color! Oh, no! Polly’s DEAD? 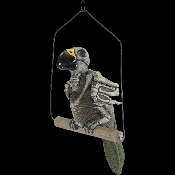 Life Size Realistic Creepy ZOMBIE SKELETON GHOST PARROT DEAD BIRD Pirate Prop Building Decoration. Skeletal Aviary Walking Dead inspired Parrot is here to greet your Halloween Haunted House and Horror Circus Carnival guests. Hanging LED Torch Fake Flame Lamp Mini Vulcan-style Simulated Fire Pot Cosplay Halloween Costume Party Decoration Prop DJ Tiki Luau Bar Decor Effects-RED. 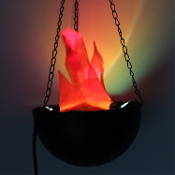 Cast some spooky light on any dark dungeon or scary haunted house with realistic simulator flaming bowl creepy cauldrons! Life Size BAG OF BONES Gothic Halloween Haunted House Body Parts Cemetery Graveyard Morgue Prop Building Supplies Decorations. Really creepy for your chop shop! Mesh bag with 12 assorted bones, including skull, hands, feet, etc. Looks like a real disarticulated skeleton. 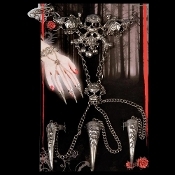 PAIR-Budget Human Anatomy Bones-LIFE SIZE SKELETON ARMS-Zombie Prop Building Supplies-Right and Left arm. 2-piece Set Life-Size Human Anatomy Bones. Need some skeleton parts but don't want to spend an arm and a leg? Look no further!